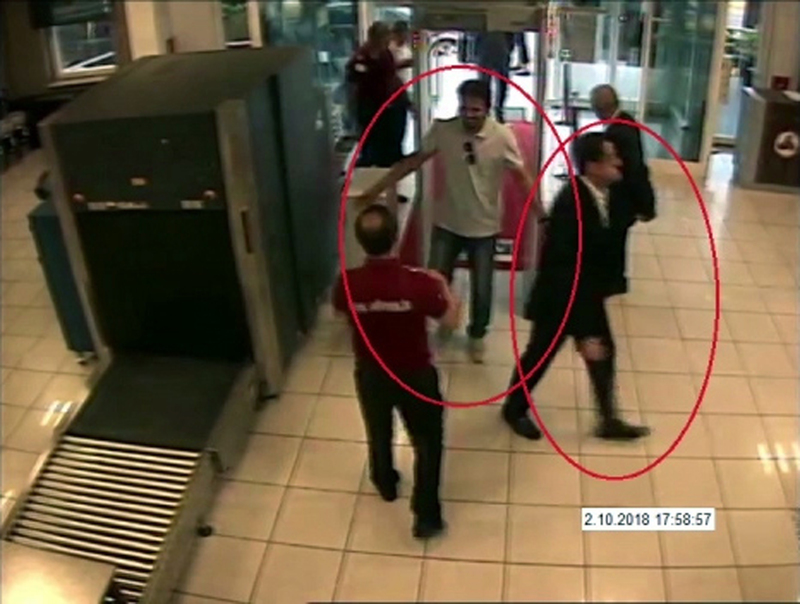 Istanbul - A man who previously traveled with Saudi Crown Prince Mohammed bin Salman’s entourage to the United States entered the Saudi Consulate in Istanbul just before writer Jamal Khashoggi vanished there, according to images published Thursday by a pro-government Turkish newspaper. The Sabah newspaper’s report showed the man also later outside the Saudi consul general’s home, checking out of a Turkish hotel as a large suitcase stood by his side, and leaving Turkey on Oct. 2. The report came as Turkish crime-scene investigators finished an overnight search of both the consul general’s residence and a second search of the consulate itself amid Ankara’s fears that Saudi authorities had Khashoggi killed and dismembered inside the diplomatic mission in Istanbul. Saudi Arabia, which initially called the allegations “baseless,” has not responded to repeated requests for comment from The Associated Press over recent days, including on Thursday. The Sabah report showed the man walking past police barricades at the consulate at 9:55 a.m. with several men trailing behind him. Khashoggi arrived at the consulate several hours later at 1:14 p.m., then disappeared while his fiancée waited outside for him. A report Wednesday by the pro-government newspaper Yeni Safak, citing what it described as an audio recording of Khashoggi’s slaying, said a Saudi team immediately accosted the 60-year-old journalist after he entered the consulate, cutting off his fingers and later decapitating him. 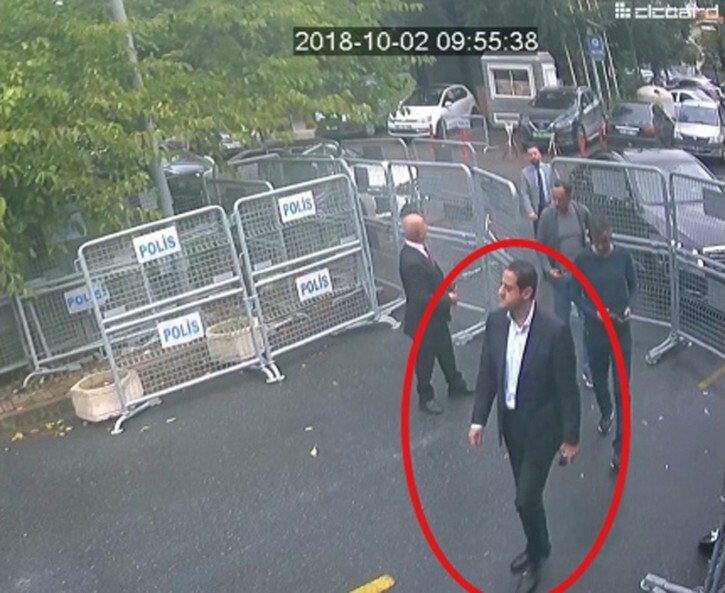 Previously leaked surveillance footage showed consular vehicles moving from the consulate to the consul general’s official residence, some 2 kilometers (1.2 miles) away, a little under two hours after Khashoggi walked inside. The Sabah newspaper showed an image of the man at 4:53 p.m. at the consul’s home, then at 5:15 p.m. checking out of a hotel. He later cleared airport security at 5:58 p.m. The AP could not immediately verify the man’s identity, though he’s one of the individuals previously identified by Turkish authorities as being involved in the 15-man Saudi team that targeted Khashoggi. Images shot by the Houston Chronicle and later distributed by the AP show the same man was in Prince Mohammed’s entourage when he visited a Houston subdivision in April to see rebuilding efforts after Hurricane Harvey. The same man wore lapel pins, including one of the flags of Saudi Arabia and America intertwined, that other bodyguards accompanying Prince Mohammed wore on the trip. The searches and the leaks in Turkish media have ensured the world’s attention remains focused on what happened to Khashoggi, a Washington Post columnist who went into a self-imposed exile in the United States over the rise of Prince Mohammed. It also put further strains on the relationship between the kingdom, the world’s largest oil exporter, and its main security guarantor, the U.S., as tensions with Iran and elsewhere in the Middle East remain high. Flying back home after a visit to both Saudi Arabia and Turkey, U.S. Secretary of State Mike Pompeo remained positive Wednesday about an ongoing Saudi probe into Khashoggi’s disappearance, but he stressed that answers are needed. On Thursday, the Post published what it described as Khashoggi’s last column in honor of the missing journalist.